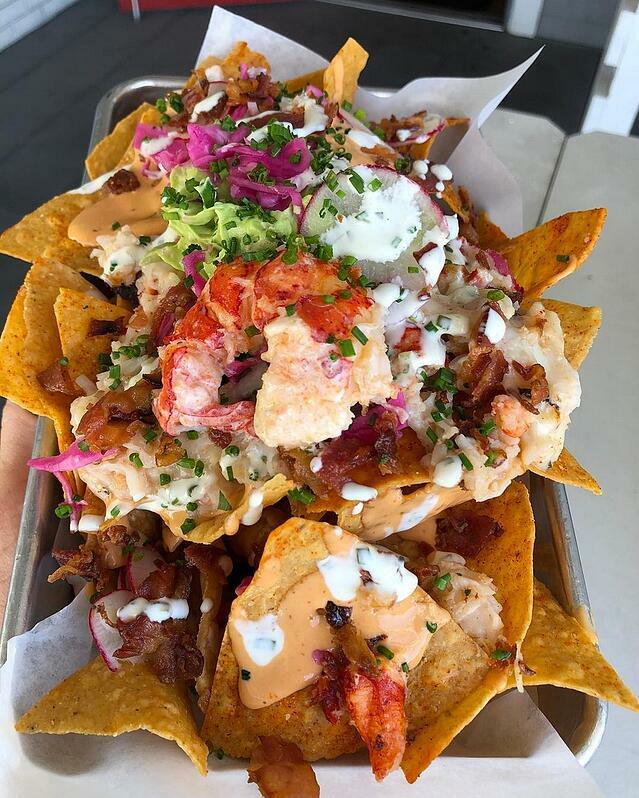 Popular California-based restauranteur and chef Andrew Gruel recently debuted a new concept, Raw Bar by Slapfish, at our Newland Center in Huntington Beach, CA. The 1,440 SF Raw Bar recently opened and is next to the original Slapfish location. Food offerings include oysters sourced from responsible seafood suppliers, seafood charcuterie, smoked fish, and a rotating menu of Peruvian style raw fish with handcrafted sauces. When the space for Raw Bar became available, Gruel had the opportunity to combine two of his visions in one place. What started as a food truck operation serving boat-to-plate seafood has grown into 11 restaurant locations with plans to develop an additional 150 locations. Gruel also owns two restaurants, Two Birds and Butterleaf, located in the indoor/outdoor communal dining area, Trade Food Hall in Irvine, CA. Raw Bar’s layout is similar to what you would find in a sushi restaurant. Guests sit at a 16-seat wraparound marble bar and watch as their food is prepared. For guests that prefer a full service experience, regular table seating is also available. Raw Bar by Slapfish is Gruel’s fourth restaurant concept and it is right on track to become one of Orange County’s favorite local hangouts. The casual, fun ambiance, featuring specialty dishes that utilize only the freshest seafood at affordable prices makes this a definite place to visit. To follow Slapfish on social media, click here. To stay informed about Newland Center, click here.